Description: To 110cm long. Body is relatively slender. Color is greenish-gray or olive with red and yellow coloration around the neck. Eyes are large. Juveniles sometimes lack the red neck, but have a large black spot on the back of the neck and indistinct black barring on the body. 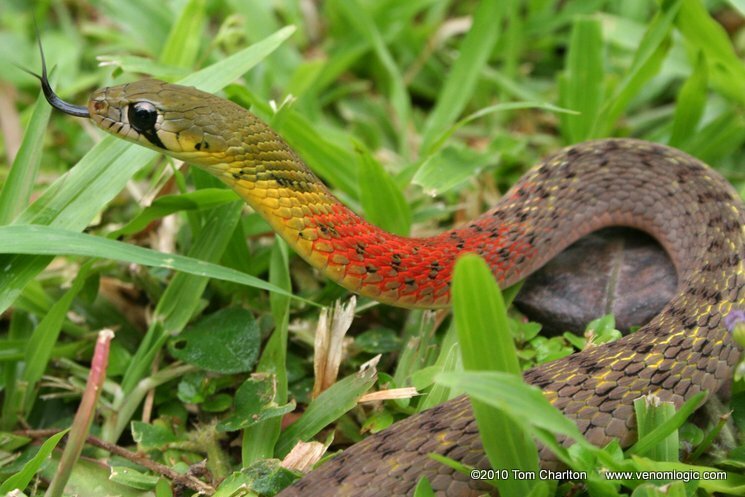 Similar Species: Yellow-spotted Keelback is less colorful and lacks the characteristic red neck. Juvenile Yellow-spotted Keelbacks lack the large black marking on the back of their neck that juvenile Red-necked Keelbacks have. Checkered Keelback has a black checker pattern on an olive-brown background. It also lacks the red neck and the juveniles lack the black marking on the back of the neck. 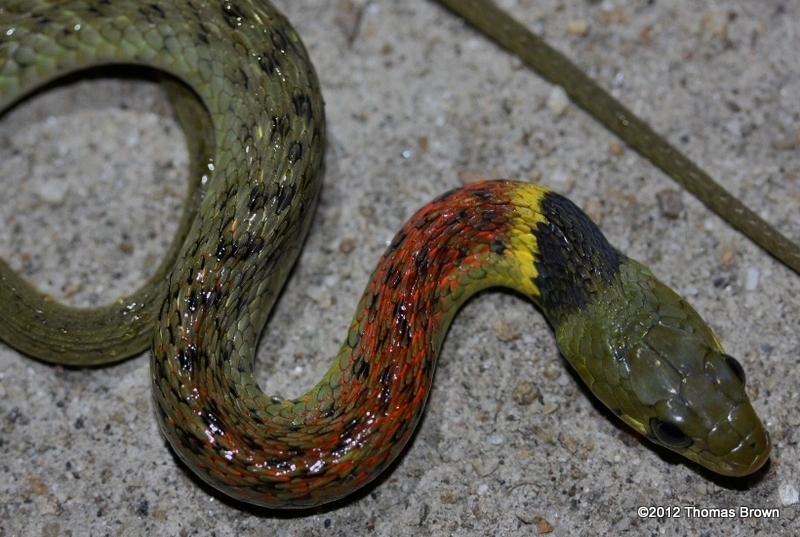 Buff-striped Keelback has a characteristic white or cream stripe on the side. Habitat: In moist forests, grasslands, or brushy areas near marshes, ponds, streams, ditches, and rice patties. Contribution to the ecosystem: The Red-necked Keelback helps control fish and frog populations. The juveniles are eaten by larger snakes, large fish, and birds. Danger to humans: This snake is not aggressive, but will bit if handled or provoked and can cause adverse affects in humans if it is able to work in its venom. These affects may include headache, nausea, vomiting, and severe renal failure (due to procoagulants). Conservation status and threats: No known conservation threats over its broader range. There is a historic record for Bangkok, but I know of no recent records and it is possible that its habitat in Bangkok no longer exists due to development. 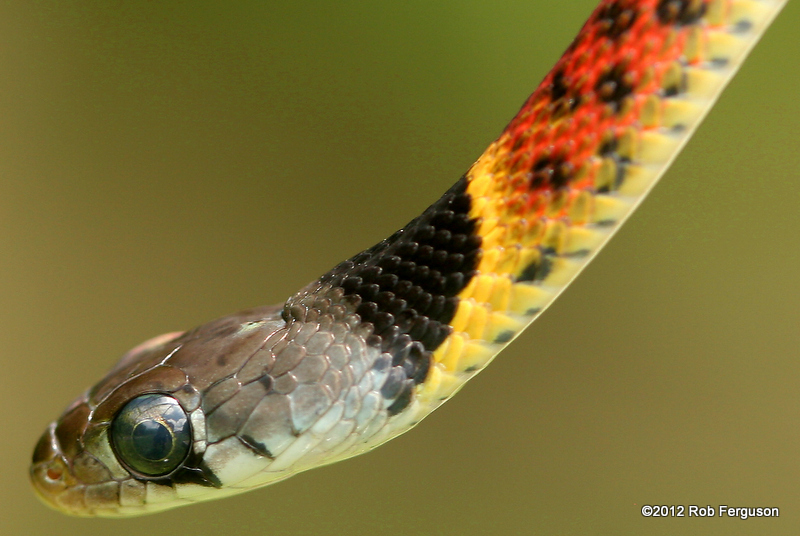 Interesting facts: The Red-necked Keelback was once thought to be non-dangerous, but several recent cases of snakebite from this species have led to serious hospitalizations. In these cases the snake was allowed to bite for an extended period of time, allowing it to work its rear fangs fully into the hand and release its venom. It is highly recommended that this snake not be handled, and if a bite does occur, make sure the snake is removed immediately and seek medical attention as a precautionary measure. 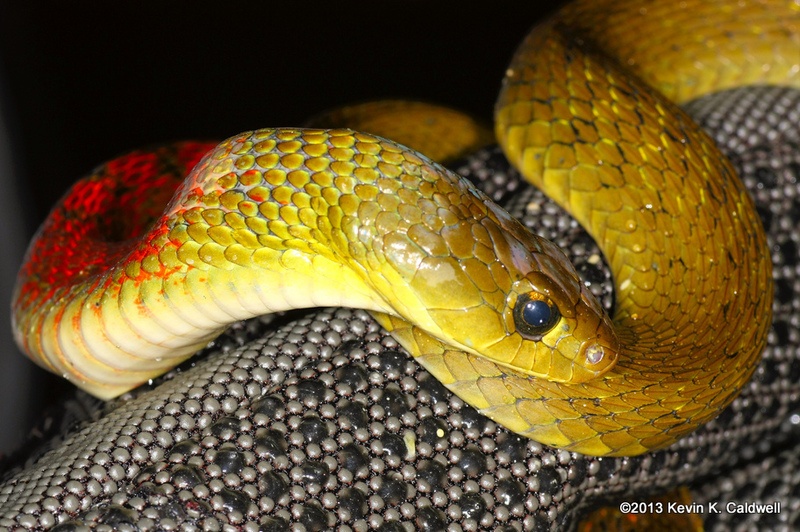 Severe coagulopathy after a bite from a ‘harmless’ snake (Rhabdophis subminiatus).